Punawale, located in north-west Pune, is fast developing as a real estate haven for both buyers and tenants on account of affordability, smooth connectivity and proposed infrastructure projects. Here is a sneak peek into the area’s backdrop and real estate prospects. Administered by the Pimpri-Chinchwad Municipal Corporation (PCMC), Punawale has metamorphosed into one of the thriving real estate destinations in Pune over the years. Earlier a village, the locale is rapidly catching up with the burgeoning industrialisation and commercial expansion. Proximity to the IT hub of Hinjewadi has been the key catalyst for the area’s realty growth. Besides, competitive property prices have also changed the realty dynamics and acted as a crucial growth driver, particularly attracting first-time homebuyers. Punawale lies in the vicinity to established localities such as Hinjewadi, Baner, Wakad, Balewadi and Aundh, and is only 5 km away from Pune-Mumbai Expressway. One of the striking features of the locale is the beautiful combination of urban developments and scenic views that dole out the much-needed relief from the city chaos. Holistically, the location stands ideal for people who prefer an abode in the midst of nature without compromising on city amenities. “While the area boasts of an assortment of residential configurations, the demand for 1 BHK flats outstrips others. Affordability, coupled with ample availability of compact residential units’ vis-à-vis neighbouring localities, has pushed the housing demand in the particular category. Moreover, the new residential developments are preferred to resale units since they ensure a host of amenities. A 1BHK unit in Punawale is available within Rs 35-40 lakh, whereas, for a 2BHK unit, one may have to shell as much as Rs 50-70 lakh,” shares Madhukar G, realty agent, Mahalaxmi Real Estate. Average weighted property values in Punawale vary from Rs 4,300 per sq ft to Rs 4,900 per sq ft. 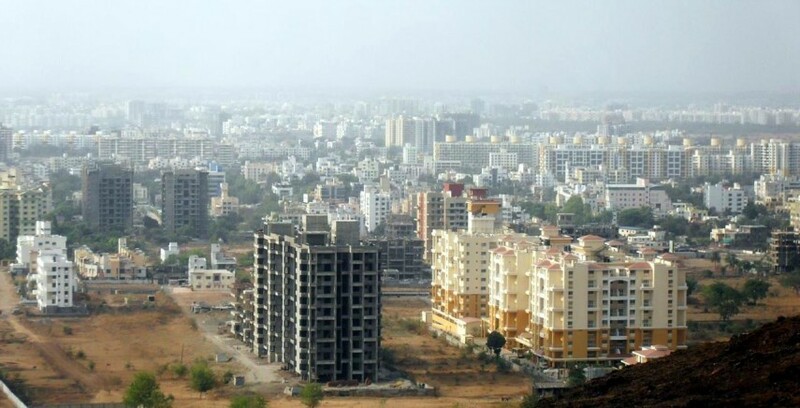 This is much in contrast to the average weighted capital ‘asks’ prevalent in neighbouring areas such as Hinjewadi and Wakad, which are pegged at a cost as high as Rs 5,100 and Rs 5,600 per sq ft and Rs 5,400 per sq ft and Rs 6,000 per sq ft, respectively. Punawale has also evolved as a popular rental hub. Most of the young working professionals, looking for affordable rental accommodations prefer the location. Overall, the housing demand in the locality is mainly driven by the tenant community and first-time homebuyers with investors’ following suit. With ever-expanding realms and burgeoning population in Pune, finding a home in the vicinity to the workplace can save a lot of travelling time, and Punawale is one such destination that promises hassle-free connectivity to the IT hub of Hinjewadi via Dhange Chowk Road. Average travelling time from Punawale to Hinjewadi is around 20 minutes. The area also ensures a smooth ride to the industrial belt of Pimpri-Chinchwad (11 .2 km) through Ravet Road and Nigdi- Bhosari Road. The forthcoming metro from Hinjewadi to Shivajinagar would further boost the area’s connectivity. The metro corridor will ensure convenient access to micro-markets such as Balewadi Phata, Baner, Agriculture College and Shivaji Nagar. Commuters can further travel to MG Road, Fassion Road, Race Course, Hadapsar Phata, Phursungi IT Park and Subhash Garden by interchanging to Metro Line 1 and 2 at the Civil Court. Moreover, the development of the Pune Ring Road is also on the card which is anticipated to fillip the realty landscape in Punawale. 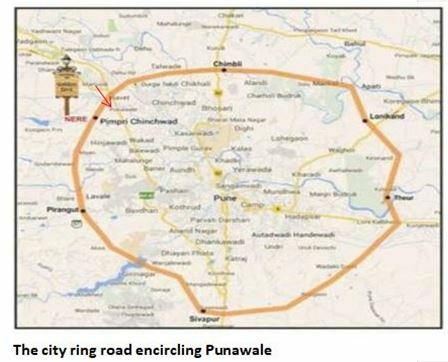 In Pimpri-Chinchwad, the road is planned to encircle the micro-markets of Ravet, Hinjewadi, Punawale, and Wakad. Proximity to the key thoroughfare will not only surge the realty demand in Punawale but would also influence property prices positively. In contiguity to micro-markets mentioned above, Punawale enjoys smooth access to daily essential amenities. Presence of several shops, grocery stores and local souks effectively meet the day-to-day requirements of the residents. The nearest shopping mall is Xion in Hinjewadi. Besides, Westend Mall and Spot 18 mall in Aundh and Wakad, respectively, are also located nearby. Property values in Punawale have recorded 15 percent growth in the last five years. Average weighted capital values have surged from Rs 3,900 per sq ft in Oct-Dec 2013 to Rs 4,500 per sq in 2018. Despite limited infrastructure facilities, the locality has been garnering healthy traction from the homebuyer community, and the trend is anticipated to continue with various infrastructure developments in the pipeline. The average weighted capital prices in Punawale are touted to increase by 15-20 percent in the next 4-5 years. The commercial expansion would also have a positive bearing on the area’s real estate growth.